Fullino Nero Rooms and Apartments v Siena, Itálie: Zarezervujte nyní! 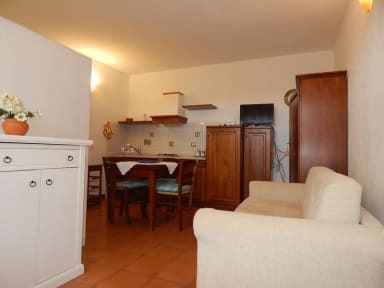 Situated in a very good position to enjoy a stay in the Tuscany countryside around Siena (3 Km from the city center), the Fullino Nero serviced apartment complex is nestled between olive trees and cypress-covered hills and the ample green area of Monte Maggio and Montagnola Senese. Recently restored, respecting the original rural architecture and the environment, featuring modern comforts and services, the Fullino Nero offers its guests a pleasant and relaxing holiday, quiet strolls along forest paths and olive tree groves or excursions and tours in visiting renowned Tuscan historic cities. The whole complex is surrounded by a lovely garden from which, by recommended paths, guests can access to an ample and secular olive tree grove, enjoying relaxing and healthy strolls around. The Fullino Nero offers 7 apartments with independent entrance and terrace with view over the surrounding hills and Siena. 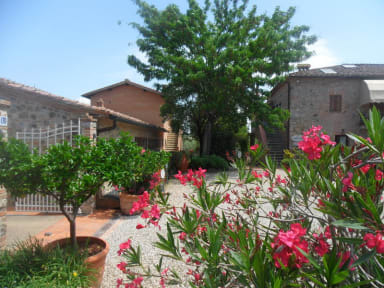 Each apartment, restored following the original rural Tuscan architecture has individually controlled air conditioning and heating, telephone, satellite TV, PC with internet access, bathroom with shower and access area, fully equipped kitchen or cooking corner. Other services available: ample private parking area free of charge, barbeque, cleaning service, daily or every 3 days change of linen, laundry room with washing machine, drying machine and ironing facilities, strongbox, access and facilities for disabled; cot available upon request. Pets are admitted at no extra charge.